Videos for Christian women, from the popular True Woman 101 study. Join Nancy Leigh DeMoss, Mary Kassian, and six of their friends as they explore God's divine design in this eight-week study on biblical womanhood. These candid videos, ideal for small group use, complement the True Woman 101: Divine Design workbook and lead women deeper into the study. If you want to discover God's design for women and embrace his high calling upon your heart, watch these videos and learn from throughout the Bible what God has in store and who he created you to be. Laugh and learn with Mary, Nancy, Karen Lorrits, Carolyn McCulley, Dannah Gresh, Erin Davis, Kimberly Wagner, and Holly Elliff. Dive into this video series, embrace God's design wholeheartedly, and watch beauty flood your life and flow out toward others. 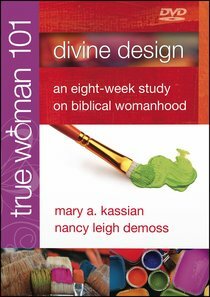 About "True Woman 101 8 Week Study: Interior Design - Ten Elements of Biblical Womanhood (True Woman) (Dvd)"
MARY KASSIAN is an award winning author, internationally renowned speaker, and a distinguished professor at Southern Baptist Seminary. She has published several books and Bible studies, including "The Feminist Mistake". A graduate from the faculty of Rehabilitation Medicine from the University of Alberta, Canada, Mary has also studied systematic theology at the doctoral level and taught courses at seminaries throughout North America.